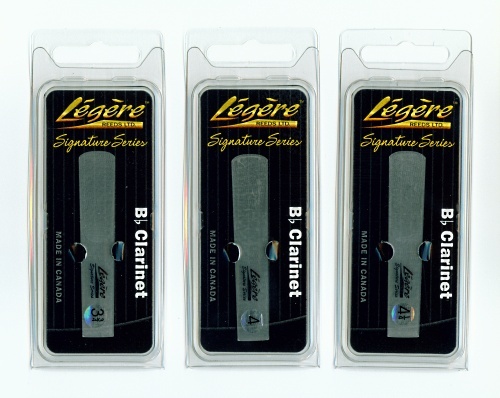 A few months ago, I posted about plastic reeds, and reported some of what I had read on another woodwind blog about the Légère Signature Series and Forestone clarinet reeds. For reasons unknown to me, the post from which I originally quoted has been removed, but there are similar thoughts expressed in a more recent post. Anyway, I got a kind offer from someone at Légère to send me a few samples. * They asked about my current cane reed preference, and sent three reeds in different strengths close to what I currently use. The Forestone reeds marks the beginning of a totally new era in the development of reeds, all reeds. It is a new beginning because these reeds are reeds which totally duplicate the feeling and response of cane. It surpasses any reed currently being sold which is not made from cane which has been grown, harvested and then cut. It does have a tremendous advantage in consistency in that it does not have to be warmed up and soaked. . . .
What this means is that it is just a matter of time before cane reeds as such, become obsolete. I have not yet tried the Forestones myself, but have used the standard Légères at times, especially for contrabass clarinets. For the very large clarinets, I had a great deal of trouble keeping cane reeds from warping, even during the course of a two-hour rehearsal; the plastic reeds have a clear advantage in this department. In my high school marching band days, I was required to use an inexpensive, brittle plastic saxophone reed. In my opinion, these are not suitable for professional playing. Neither are the plastic oboe or bassoon reeds currently on the market.